The Panda Research Review from Does It Really Work?™: Scam or Legit? Does Panda Research Really Work? Panda Research may have a cute name, but can they really help you make money from the comfort of home? Everyone wants to earn money online, and the idea of taking a survey and having someone pay you for your opinion is very enticing. There is much debate as to whether these sort of sites actually work, and our first thought is that none of them do, but we dug a little deeper to see what Panda Research is all about. Paid surveys online have been around for at least a decade, and is a booming industry, with new players coming into the game all the time. Panda Research boasts that they’ve been around for 7 years now, and that they have paid out a substantial amount to their members, an average of $2.5 million annually. This might be impressive, but they do not divulge how many members this was to, so it’s hard to gauge what sort of checks people are receiving. They claim to have paid out over $1.8M to those completing surveys. They say they currently have a Credit Score Review survey that pays $12 and a Cable TV Survey that pays $50.00. They claim that their surveys can pay anywhere from $3 to $75, but of course most people only see the $75 max and think that this is the kind of surveys they’ll be taking, and that it will only take a few minutes to give their opinion. They also say you can get coupons, discounts, rewards, giveaways, gifts, and other items that are uniquely tailored to your tastes and interests, based on how you answer the surveys. Read: They are going to spam you with offers every time you complete a survey. They also claim that you can refer friends and family to it and you’ll get a 10% bonus from all of their payouts for as long as you use the system. They make payments twice per month and they pay through PayPal. The hype is that this falls into the make money effortlessly and from home category that many people fall victim to. Making money usually requires know-how and effort, and if it doesn’t, you’re usually sacrificing something else such as money, or time. 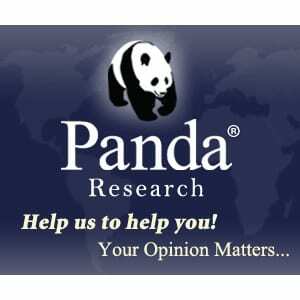 It’s free to sign up as a member of Panda Research. You may be asked to sign up for an offer in order to get credit for taking a survey. This is where you can just choose not to sign up, or sign up if it sounds like something you’d be interested in. But you shouldn’t sign up for something just to get credit for the survey, because that could add up pretty quickly. You definitely have to put the time in to complete the offers and even have a chance at accumulating money with Panda Research. This is not something that you can just sign up for, and forget about, and expect to make anything with. You also have to bug your friends to try it, or set up some other way to attract other users before you can receive a payout of your funds. It seems that the terms and conditions make it really hard to actually see any money from this endeavor. They have stipulations like you have to have 5 people join under your account before you can receive a payment, and also that you have to have $100 clear before you can request a payout. The word “clear” is where they get you, because they have to confirm your funds before they are released, and there are reports of people having over $1000 in a “pending” state, and therefore not being able to withdraw the cash. We going to have to give a thumbs down on Panda Research. There are too many conflicting reports from users that said that you have to actually sign up for offers in order to have your funds clear, which means that you will likely end up paying for some service or product just to collect your payment for taking the survey. One thing that we do like is that they make it pretty easy to unsubscribe from the site, and claim to delete all of your personal information when you do so. There are some sites out there they complicate this process, and store or sell your data and personal information to third parties in an attempt to milk your account for all it’s worth. Also, they never claim that you’ll get rich taking surveys, which is another way that many of these sites rope you in. They say that this should only be used to make some extra money on the side. Some sites out there say you can make a full time income or more by taking surveys or reading emails. Since it’s free to sign up, why not give it a try? You can stop at any time, and this is really the only way that you’ll satisfy your curiosity. If you come to the point where you need to use your credit card to sign up for an offer, just don’t. And if you get fed up with them, just go through the account deletion process and you’re back to normal. What do you think? Does Panda Research work or not? I’m afraid i have to disagree with your recommendation. It’s good that it’s free to sign up, but it’s so time consuming to take these surveys and for such a little reward it’s just not worth it. If you’re really desperate for the cash there’s better ways to get it. It’s going to take you a lot of commitment to make any decent money with surveys. I found the surveys to take much longer than advertised. I have accumulated some funds with Panda but think there are better uses of my time. I would not call Panda Research a scam, but I would call it a waste of your time. As a member of this site for around six months, earning any amount of cash with this site seems to be hard to do. Most of the surveys that are sent to your email are those that you do not qualify for…Perhaps they are simply gathering profile information to use in the future. During my time as a member I qualified for one of their surveys, which earned me a whopping 50 cents. If you are looking for something that will help you make money, this survey site is not the way to go. You will find yourself spending more time attempting surveys that making money. Don’t think they’re a scam but not worth the time. I’ve done countless surveys, fulfilled offers, and trial offers, only to find out my balance is only $3.00? I’d get a verification email saying congrats you just made this and that and some amounts were $10 or more. I just submitted a ticket and if I don’t get a favorable response, in not wasting any more time. I have done 52 survey as of May 30th and here it is June 19th and all I see is $3.42 REALLY!!! I would definitely say this is a SCAM Stay far away from Panda Research. I’m not sure, i got an email to register to this Panda site, and i was like oh what the heck! IDK if its legit or not tho. Ive sent them an email asking them When does the Money get approved and is on the account so i can REQUEST a payment…. but idk if its gonna work or not. It’d be cool tho. 🙂 Lets see what happens!! Did you ever receive your money from Panda Research? Just wondering and doing a little researching on these survey things online. I joined Panda Research about a month ago and at first, I thought it was legit according to google but comes to find out, its full of crap. You do the survey, it says you earned whatever amount of money for taking the survey and you never get the money. They said it will take from 2 days up to a week and I’ve been waiting for my $90 to be in my Paypal account and it’s never coming. What a total waste of time. Never again. They need to take things like that off the internet. They are luring people into their website for them to supposedly earn money and get rich but they never receive the money. They are earning money for the number of people visit their website while the people on the other side is broke and wants to make some quick cash. Publisher’s Home Clearing is legit. Want free money, visit them! I worked this site for a long time until in November 2018. I made enough to request $50.00 payout. I was patient waiting for my payment, but it never did come. I even wrote them in contact requesting payment and never received a reply. I would have to say this is a scam where you are working to make them money, yet they give nothing back in return to you. I gave them a chance to reply and they ignored my request.